When you run the long, gradual uphill climb that serves as the half marathon route here in Red River, New Mexico, you’ll see why so many skiing and snowboarding enthusiasts make the trip here every winter and hikers, mountain bikers, golfers and fishermen trek here in the summer — it’s one of the most beautifully scenic mountain resort towns anywhere in the southwest, here at 8,750 feet above sea level. That’s why organizers point out that runners should most definitely not expect to record a personal best time at the Red River High Mountain Half Marathon & 5K. Runners experience an overall elevation gain of about 700 feet over the course of this out-and-back race, which starts and finishes at the corner of 3rd and Main Streets in downtown Red River, which is named for the river of the same name that flows through the town. Red River’s history as a town dates all the way back to the 1870s, when explorers first discovered its gold, copper and silver deposits and began what would become the town’s first boom period, as hundreds of mines were carved into the mountains surrounding what is now its downtown district. 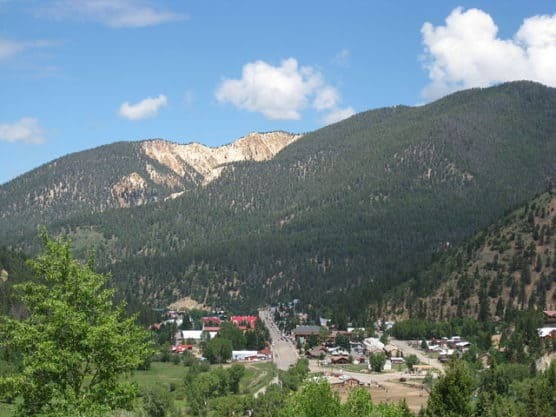 Today, of course, the mines have long since been exhausted and the town’s main industry is tourism thanks in large part to its abundant wintertime snowfall, mild summers and the plentiful natural beauty of its forests and mountains, filled with ponderosa pine, aspen, spruce, Douglas fir, cottonwood and more. From the starting line in town, runners taking part in the half marathon make what is basically one long out-and-back run that roughly parallels the Red River for most of the race, along Highway 578 from downtown all the way up to the turnaround point, which runners will hit just before 578 ends, at an elevation of just above 9,400 feet above sea level. All around, runners will be able to take in views of the mountains including Wheeler Peak, whose 13,000-ft.-high peak looks over onto Red River and the surrounding forests. Because the weather may be cool in the early August mornings — due to both the time of year and the high elevation of Red River — organizers encourage runners to dress in layers, so they’ll be warm enough at the start of the race and will be able to shed excess layers as they warm up out on the course. Nestled high in the Sangre de Cristo Mountains of northern New Mexico, just over 100 miles northeast of Santa Fe, Red River typically sees cool to mild weather in August, a month that has brought record temperatures as low as 26 degrees (in 1992) and as high as 85 degrees (in 2002). On race day (Aug. 3), the average low is 42ºF and the average high is 74ºF. See the race route map for the Red River High Mountain Half Marathon here. To reserve your spot in the 2019 running of the Red River High Mountain Half Marathon or 5K, register online at Active.com here. Ever run in the Red River High Mountain Half? Share your impressions here, or post your review in the Comments below. Good to know, SD! I’ll look into it and make any corrections we need to here.